Leeds United boss Thomas Christiansen has revealed that he intends to rotate his squad for this Sunday’s third round FA Cup tie at Newport County. Fringe players are set to step in as Christiansen looks to give his first team regulars of the last few weeks a rest after their efforts at lifting the Whites back into the top six in the Sky Bet Championship. 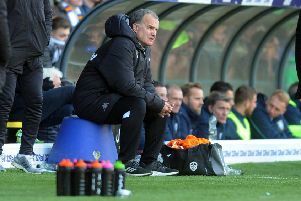 All the players who appeared in the gruelling four games in 10 days played over the holiday period look set to be given a week off with the exception of at least one of the defenders with Leeds short of numbers in that department. With Ronaldo Vieira injured and Conor Shaughnessy probably needed in the back four they are looking short of options in midfield as well. One player set to play according to Christiansen is on-loan left-back Cameron Borthwick-Jackson, who has hardly featured since his move from Manchester United and was believed to be on the verge of returning to his parent club. When asked about the player’s future on Monday, the United head coach was not forthcoming, but did say that he would be in the team for the Newport trip in a game that offered rotation possibilities. Other fringe players who can expect a call-up include Vurnon Anita, who did come on as a substitute for the injured Luke Ayling against Nottingham Forest, but had not featured in the team for the previous 11 matches. Mateusz Klich is also expected to be involved after the Polish international midfielder was brought back into the fold last weekend, coming on as a sub against Birmingham City to play his first game for more than two months. Hadi Sacko could be given only his second starting slot of the season on the wing after ending his five-match run without a game as a late substitute against Forest while Andy Lonergan may be back in goal based on previous selections in the Carabao Cup and Jay-Roy Grot will be in contention up front with his only two previous starts for Leeds coming in that competition. Despite a rotation policy in the Carabao Cup United managed to have a decent run to the fourth round and Christiansen will be hoping Sunday’s game is the start of another run, but he cannot afford to take victory for granted with the Whites’ awful record of cup shocks down the years. He only has to look to last year and Leeds’ defeat to non-league Sutton United for evidence of how it can go horribly wrong when you leave out too many first team players in this competition. Whoever starts, he is likely to give himself a safety net by fill the bench with some of his best players. Leeds will be making history whatever the result as it will be the first time they have ever visited Newport’s Rodney Parade home ground. They have only met the Welsh club twice previously in their history – including a 5-1 Carabao Cup second round win back in August when the tie was switched to Elland Road and Roofe scored a hat-trick after County had taken the lead. The tie kicks off at 12 noon and has been chosen as one of seven matches to be televised over the weekend. It will be shown live on BBC Wales, which can be picked up on Sky channel 952 and 978.